All of our rooms are furnished to a high standard, and comfort and cleanliness are a top priority. Steven, our resident chef, has over 30 years experience and therefore, is able to cater for every need to the highest quality. Open on request during the day, and closes at midnight. Our prime position in the town centre opposite the Winter Gardens and Houndshill Shopping Centre, and only minutes from the Tower, Beach, Theatres and Attractions, makes us the ideal destination for your holiday. We are a good size Blackpool Hotel with a regular entertainment programme and choice menu, but we still retain the comfort and hospitality of a family run establishment. 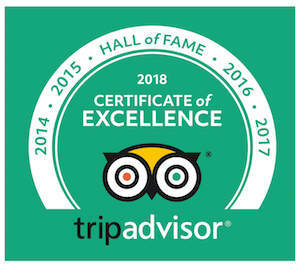 This year we have been awarded TripAdvisor's 2019 'Travellers Choice Award' for being in the Top 25 Bargain Hotels in the UK (N0.10), and also the 'Visit England Breakfast Award'. as frequently described by returning guests. This popular hotel has been owned and managed by the Dickson family for almost 60 years, and it is now managed by Derek and Caryn Dickson, with Steven Dickson as Head Chef, providing a varied and delicious choice of home cooked food. Adelaide House Hotel caters for couples, families, over 60s, dance competitors and conference delegates. Please note that we do not accept Stag or Hen Parties at this hotel.